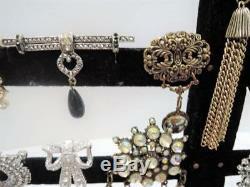 HUGE VINTAGE BROOCH LOT178 PCDESIGNER SIGNEDRHINESTONES+++. 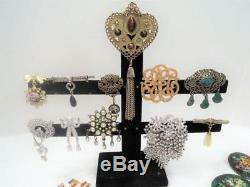 This is a huge lot of vintage brooches, and there are many fancy dangling pieces, shown on the rack at back and on table to left, as well as tons of rhinestone pieces and more. 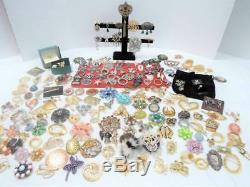 This lot contains a total of 178 pieces with a pair of flag pins with matching earrings counting as ONE. 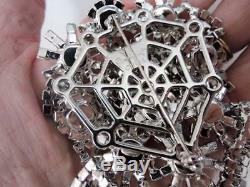 Spoontiques Pin art on card. 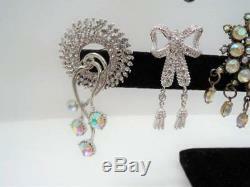 SWAROVSKI on card with original pouch. 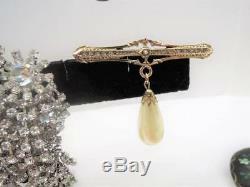 Huge crystal dangling brooch, show pic of back and signature, very large and grand and MINT condition. 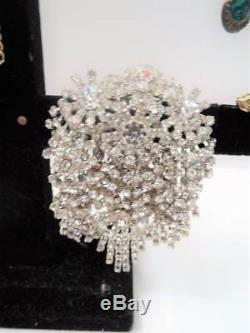 ROCSLIDE -2 of these brooches set with crystals, very fancy with slide clasp that slides on over waistband, pocket, lapel etc. VATICAN LIBRARY in original box with tags. There may be other pieces signed, but I did not turn over every piece. IF YOU WISH your package insured against loss, PLEASE TELL ME so that I can add that amount to your bill. Read the description and please ask questions if there are specific things you need to know. 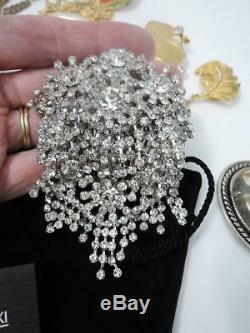 Have a good working knowledge of vintage jewelry, as most of what I see has been pre-owned and will thus have some form of wear. Shades of blue are subjective and so are concepts of what looks "too good" to be vintage, or what is "too worn" to be acceptable to a collector. IF you have specific needs, do your part, and contact me. I will combine for 7 days and then invoice MUST BE PAID. I HAVE CHANGED MY POLICY and NOW WILL ONLY COMBINE ITEMS WON OVER A 3 DAY PERIOD. I cannot extend out to 7 days any longer, as folks try to go even longer, and I need to keep things moving. You may combine over a three day period, starting with first day of items won. However, I cannot run with this for more than five days. So any combining really needs to be done within five days and then let me get your package in the way. READ NEW AUCTIONS NOTES PLEASE. So, make sure and check out all my auctions, and know that I will combine ONE WEEK AT A TIME ONLY! 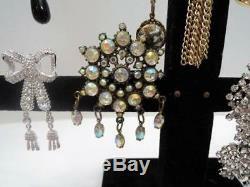 I will not carry over last weeks auctions to include this weeks. I will combine week by week. I love to combine your wins, however, I really need to keep combined orders to a three day period. I CAN DO FIRST CLASS TOO< but it cannot be tracked and minimum charge is 3.95. I can fit usually 2-3 pieces for this price, depending on bulk. I just think the flat rate 6.00 priority is better! However, should you win multiple auctions, I will first package everything and weigh and then invoice you with both a first class option, if under four pounds, and a priority option. I want my customers to be happy. That being said, I expect you to read the auctions and all the details and view the pictures. IF you have questions, I will happily answer. I will take a return if I have made a mistake and there are flaws with the items. Please be clear on this. That is, unless the mistake is mine. 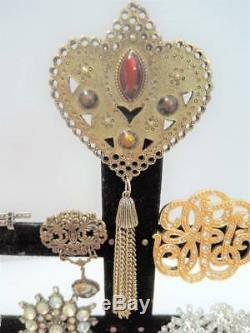 Now, I sell mostly vintage jewelry, out of various estates. This means that it has been pre-owned. That means that it could have some light wear, possibly some tarnish, or some such. IF there are any flaws, such as missing stones, or damaged stones, I will definitely make that clear. I just need you to understand that I generally do not sell brand new items. Txzj pxzj3980 txzj-11 txzj5 txzj66 txzj115. 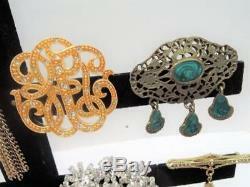 The item "HUGE VINTAGE BROOCH LOT178 PCDESIGNER SIGNEDRHINESTONES+++" is in sale since Friday, November 9, 2018. This item is in the category "Jewelry & Watches\Vintage & Antique Jewelry\Costume\Retro, Vintage 1930s-1980s\Collections, Lots". The seller is "the*pink*panther*vault" and is located in Oak Harbor, Washington. This item can be shipped worldwide.